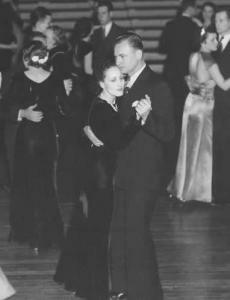 Simplicity Was Essential to its Popularity: If they approached ballroom dancing in the '20s and '30s as we do today, as a complex mix of defined steps and practiced routines, it would not have been as nearly as universal as it was. If dancing was hard, there would not have been a crowded dance floor at every fairground and every public event, in every hotel and nearly every restaurant or passenger ship. There would not have been packed dance halls in every part of every city, and in small towns from California to Texas to Vermont; and lonely men would not have gone to taxi dance halls to pay women for anonymous Fox Trots. If dancing were difficult, it would not have held the central place it did in the social interaction between men and women. Nearly everyone danced, so they danced in a way almost anyone could do. It's Just Walking: The essential step is a walk. You walk forward, you walk backwards, you walk and pivot to the right or left. You can walk in "slow" time (one step on every other beat) or quick time (one step on every beat) or mix it up in slows and quicks - and maybe throw in a few glides and drags, or maybe do a two-step. It's all up to you. You are free to do any step that fits the music and your partner can follow, to include just walking if that works best for you. You Hold Your Partner Close: You are in body to body contact. This is not a minor stylistic detail, this close connection to your partner is essential to this type of dancing - though it can be a bit jarring to the modern sense of personal space. The posture is relaxed and there is no "dynamic tension" or "frame". The Follow does not offer resistance with her left hand, or in fact any resistance at all. They use this close connection to flow through the dance as a single unit. The lead comes almost entirely from the upper body (the "core") and many of the odd dance holds of the time seem designed to remind you to not try to lead with the hands. The Lead Leads How and Where He Likes: With this close hold and simple step, the Leader can (within reason) make things up as he goes along and the Follower will instinctively follow. He can be entirely spontaneous if that is how he likes to dance. This can be a little jarring to Follows who are poised for cues to launch into practiced routines. While there's nothing to stop you from doing practiced routines (the "instructional" films of the time are full of them), the Follow usually just relaxes and goes with the flow and the real challenge is not over-anticipating. This also requires the Lead to be clear and unambiguous. Everyone Does Their Own Dance: The dance is infinitely variable and as complex as you want it to be. It's fine if everyone else is doing something else. It's your dance. Dance it in a way that works for you and your partner. Let the Music Tell you How to Dance: In such a simple dance, the thing that makes it dancing is how you move to the music. Listen and flow with the music and with your partner. Jazzy music should lead to jazzy dancing, smooth and romantic to smooth and romantic dancing, etc. Since it morphs to fit the music, it is infinitely adaptable and changeable. You can Fox Trot to almost anything. It's OK to Keep it Simple: Most of the dancers of the era were content with a few basic steps and moves. If you and your partner love complex steps and routines, go for it; but there is no requirement and expectation to go from one practiced routine or step pattern to another. You also dance in such a way that you don't disrupt the flow of the other dancers or take up more than your fair share of floor. Further, since you are so close together, your feet are constrained in where they can go and your visibility may be obscured by being so close to your partner's head. This results in a very contained style of dance. If you want broad sweeping moves, this is not the style for you. It does however, work very well on a crowded floor. Focus on Your Partner not an Audience: The dancers of the time usually didn't come out of their embrace to do underarm spins, throw outs and the like. They remained connected to their partners and did not worry about putting on a show. There was no one but your partner, and other people existed only in so much as you didn't want to run into them. They didn't try to be Fred Astaire and Ginger Rogers. Fred and Ginger were Exhibition Dancers, which was, at the time, a completely separate world. Today, with such an emphasis on competition, our social dancing often focuses on audience-pleasing moves in a watered down form of exhibition dancing - not so in the Jazz Age ballroom Fox Trot. And Finally, Relax: Enjoy your partner's company, chat, laugh, smile. The dancers of the Jazz Age are telling us to stop overthinking and just dance. Dancing well is not about how it looks, but how it feels. The following video will, I hope, make sense of all I have just said.